Thick, dark green, and weed-free is how most of us define a great lawn. But attempting to eradicate weeds by making repeated, broadcast applications of weed control is not good for either the lawn or the environment. The solution to keeping weeds under control is to carefully combine good cultural practices, proper fertility and, when needed, herbicide applications. Most weeds love sun and heat. Keep the soil shaded and reduce weed germination with three easy steps: mow higher; water enough to keep the turf healthy and growing; and aerate the soil regularly to encourage healthy grass roots and a thicker lawn. These are all good cultural practices and are the first step to controlling weeds. Besides giving lawns an attractive color, fertilizer gives weeds the kind of competition they don’t like. Regular applications of fertilizer work to constantly build up the lawn, making it thicker and expanding its root system. Any lawn that is kept thick has fewer weeds, and therefore herbicides are not needed nearly as much. Even with good cultural practices and fertilizer programs, some weeds are bound to appear, and that’s when treatment is needed. The third step in this system is treatment with the right herbicide. 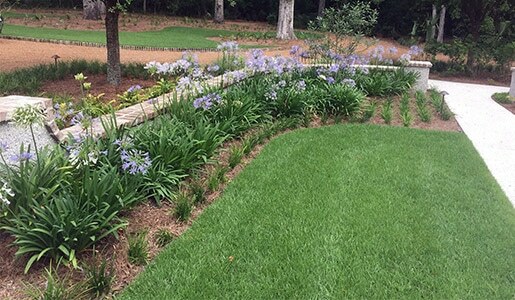 In most lawns, a combination works best. Pre-emergent is applied early to all or most of the lawn to keep weeds from sprouting and a post-emergent is used on a spot basis to control those that do get through. Every lawn has a few weeds that “sneak in” between visits, but working together, we can keep them from becoming a real nuisance.